Having a car means you can travel to a variety of different places to walk your dog, which gives you a change of scenery and your dog the chance to join the family more often. But what happens when your dog becomes older and is less able to jump up into the boot for the journey. For many people this causes a dilemma: Am I able to lift my dog into the car or shall I just leave them at home? Thankfully, there is a way you can continue to get your dog into the car without risking injury to yourself – by using dog ramps, steps and stairs. These are ideal for older dogs, dogs with joint problems, and overweight dogs. Lightweight Ramp. If you’re looking for a ramp which is very lightweight for ease of use then try the Doghealth Lightweight Bi-Fold Ramp. This ramp weighs in at just 5kg, but is still strong enough to support dogs up to 90kg in weight. It comes with an anti-slip surface and 6cm raised sides to give your dog confidence when walking up or down it. At 155cm long when folded out for use, it is suitable for most cars. Folds in half to transport. £39.99 from Amazon . Percy’s Tips: Dogs deserve a great diet! Click here to find out about the benefits of natural dog food! Wooden Ramp. 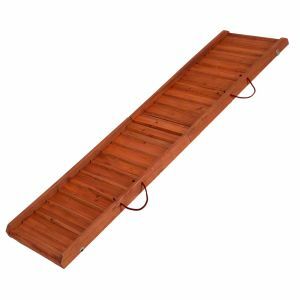 The Backstage Wooden Dog Ramp is sturdy and would suit those dogs who are not so keen on the non-slip surface covering or many other dog ramps. Instead, it has small steps built in to give the dog grip and stability. Suitable for dogs up to 50kg, it comes in either a 120cm or 160 cm length for different car heights. From £29.90 (Save up to £30) from Zooplus. Free-standing Ramp. If you prefer not to, or are unable to support the ramp on the lip of the car boot, you could use a free-standing ramp. This prevents any chance of damage to the car or the ramp slipping off during use. The Rosewood Pet Gear Free-standing Ramp stands at just under 60cm tall and can support dogs up to 90kg. The legs have rubber feet to stop them slipping and a removable grip cover. Save over £38 when you buy one for £61.31 at Amazon . Percy’s Tips: Protect against unexpected vets bills. Read our full guide to insuring your dog! For very high vehicles and 4×4’s. If you require a ramp for a high vehicle then you should look for one which is extra long so that the gradient doesn’t end up being to much for the dog to easily climb up. The Solvit XL Ramp is just the product for the job. At 220cm long it can reach up to even the most pumped up off roader. Suitable for large breed dogs, with a non slip covering for safety. £124.99 from Amazon . Sometimes a dog ramp isn’t suitable because of space restrictions and so a set of dog steps may work better. They can also be good if your dog is not keen on walking up a ramp and prefers the more familiar ‘steps’ choice. The Solvit Pupstep Plus is a sturdy set of steps which stand at around 50cm tall allowing your dog to reach the car with ease. They can also be used in the home if your dog needs help accessing other areas. £34.99 at Amazon . Percy’s Tips: Flea problem? Read our full guide to flea treatment and prevention!